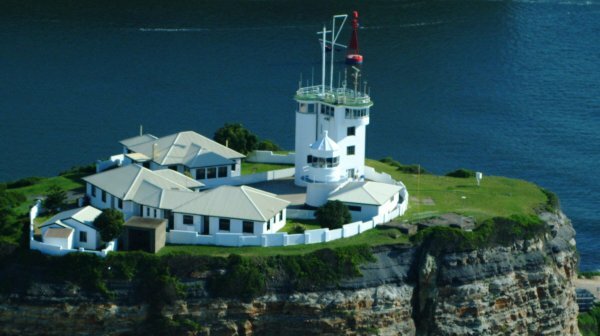 Nobbys Head Lighthouse | Lighthouses of Australia Inc. 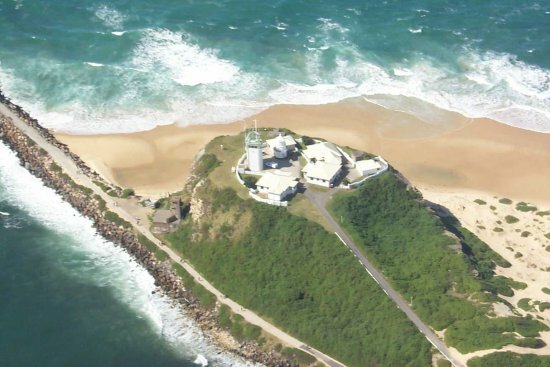 The Nobbys Head Lighthouse was established on an island whose future was doubtful right up the period prior to the light’s establishment. 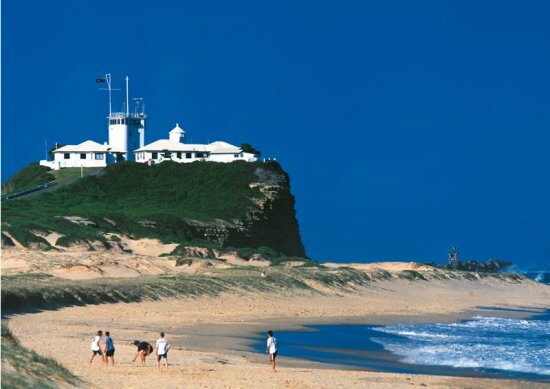 The present lighthouse was established on Nobbys Head in 1854, which was then a small isolated coastal islet just off Signal Head. 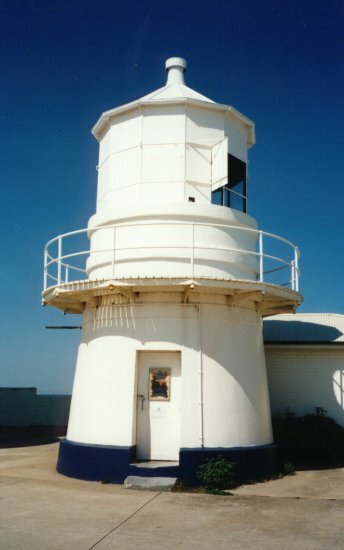 It was only the third lighthouse built in NSW after the Macquarie Light in 1818 and the Hornby Light that was also built in 1858. 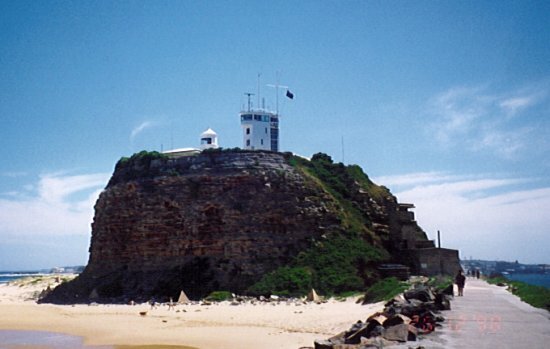 The first beacon had been lit on Signal Hill in 1804 to guide vessels into the Hunter River. It was an open coal fire that was only seen for several kilometres. An oil burning light in a large metal device was established in 1821 and was visible for 12 kilometres. The oil light was not reliable so the beacon reverted to the coal fire once again. The small tower has since been dwarfed by the taller buildings that house the Signal Station and Port Watch, amongst other things. 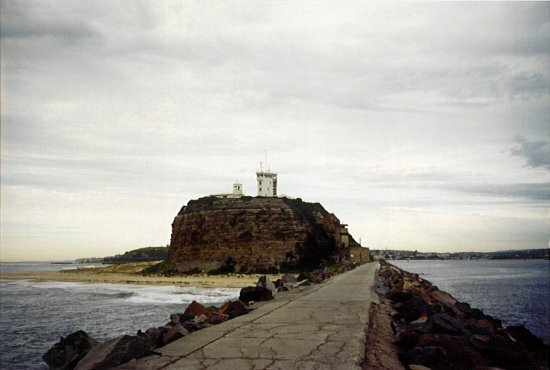 Originally called Coal Island, the Nobbys Head said to have originally been 60 metres high, was joined to the main land by a causeway that was begun in 1818 and later completed in 1846. In 1854 it was intended to blow the island away to improve the harbour but strong public protests forced cessation of the work of destruction. However the island was further reduced to 25 metres to accommodate the building of the lighthouse and signal station in 1858. The original 20,000 candle-power light was attended by three keepers. The light was converted to electric operation in 1935 and demanned.